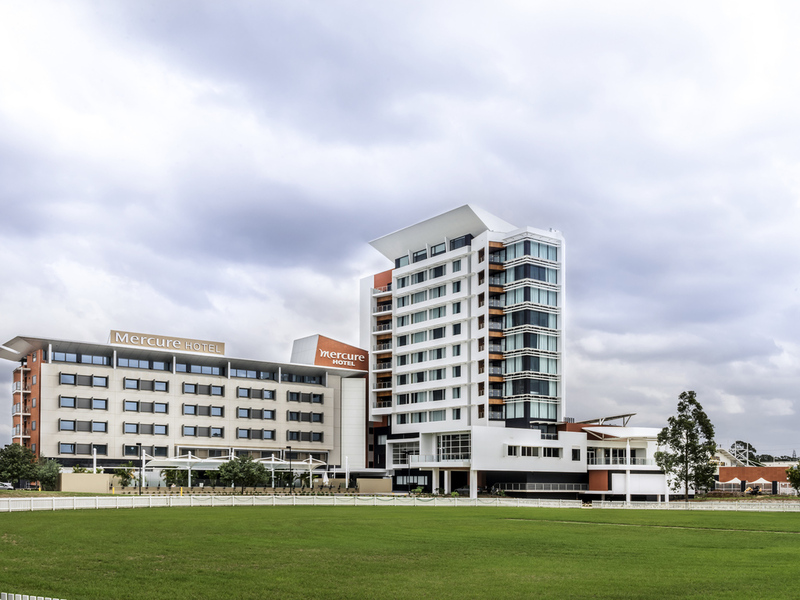 Located 5 minutes from Liverpool town centre, 30 minutes from the airport, the expansive Mercure Sydney Liverpool is ideal for both business and leisure. Adjoining the Liverpool Catholic Club, this extremely modern hotel features 104 beautiful rooms, plus unbeatable facilities including a gym, ice rink and mini golf course. Ideal for events of all kinds, Mercure Sydney Liverpool boasts conferencing facilities for up to 1200 guests, along with a range of bars and dining options. Liverpool is a vibrant hub for business and industry in the heart of South Western Sydney. On the junction of the M5 and M7 motorways, it is within easy reach of Sydney CBD, the airport, Sydney Olympic Park, the Blue Mountains, Canberra and more. Our standard rooms are contemporary and spacious for the modern traveller, with luxuriously soft beds, LCD televisions, and complete connectivity via Wi-Fi and our Media Hubs. Available with a King size bed or two Queen size beds. Our Privilege and Superior rooms, on the top floor, are spacious and light filled, with wall-to-wall windows and spa baths. Privilege rooms add a touch of luxury with complimentary internet, bottled water, chocolate and an in-room espresso machine. The Club Bistro serves delicious, informal meals at great-value prices in a warm and friendly environment. The Sports Café is attached to the complex's ice rink and serves tasty, quick meals to give you a burst of energy while you cut the ice. Relax in the Club Café, serving a selection of hot meals, sandwiches and cakes. Rich, aromatic coffee is prepared exactly to your liking all day long. The Atrium provides a stylish, contemporary setting for a relaxing meal. The Atrium serves an innovative international menu including a selection of mouth watering grain-fed steaks and seafood. The club's main bar is comfortable, friendly and stylish. It features a giant plasma TV showing FoxSports, with personal portable wireless speaker systems allowing you to watch your channel of choice without distraction. Located adjacent to the restaurant, the cocktail bar is modern and stylish. Unwind over an expertly-prepared cocktail at the end of the day or enjoy a post-dinner drink on the heated, covered outdoor terrace. Conveniently located in the middle of the gaming floor, refreshments are at your fingertips at the Poker Machine Bar. The TAB Bar offers complete betting facilities. Whether you prefer the horses, soccer, boxing or something else, you can place a wager on your favourite sport with delicious refreshments nearby. The rooms were clean and quite comfortable. No help with luggage to or from room. In room dining was dreadful and for example a bowl of soup took over an hour and a half to come and was cold on arrival - for which we received it complimentary - would rather have had the food & hot. Atrium Restaurant food only fair and one night the service was dreadful, I actually had to go into the kitchen to ask for some service. Very comfortable and excellent staff on site. Great place to stay, easy access with local club facilities available to guests at the member only venue. It's a great place - clean and neat with professional and courteous staff. Very pleasant - no great concerns of any kind. Convenient location, Friendly & helpful staff, Tidy. Location was ideal for us, tidy rooms, helpful friendly staff behind the counter. I stay here family and happy with all the facilities. Located in the Catholic club there’s also an outdoor mini golf, iceskating, complimentary gym, an oval. For the adults there are dining options, bar, pokies, bingo nights - fabulous !! Don’t even need to leave. I also found with the location it’s approximately an hour to blue mountains, Harbour Bridge, Bondi is you travel on the motorways. Perfect location for when we come to visit our family. Beautiful inside the foyer and rooms. Rooms have always clean to perfection! Very pleasant with great customer service. Room was very spacious, clean and tidy. Couldn't have asked for nicer accommodation!! I have stayed a number of time and always greeted with a friendly smile with easy check in and direction to my room and the facilities on site. Rooms always clean and well presented. Great service without any fuss or dramas. The staff are attentive and the facilities exceed expectation for the price. Extremely modern and well appointed. Room and bathroom were huge. We felt the bathroom could have had dimmer switches, the toilet is lower, loved the carpet. Staff very helpful. As always, we were well taken care of by staff. The room was comfortable and in good condition. Will definitely return to stay at this hotel again! I have been staying at Mercure Liverpool for several times now, I must say that this time was my most satisfied experience at this hotel because, finally someone knew to use my complimentary drinks couch to redeem the bottled water I drank from the mini bar upon my checkout!